Catalan independence supporters celebrate the December 21 election results. At first glance, the result of the December 21 Catalan parliamentary election changed little. Despite the emergence of the Spanish-unionist Citizens as leading party, the pro-independence bloc still commands an absolute majority of seats and a relative majority of votes. The pro-Spanish unionist bloc still falls short on both counts, and Catalonia Together-Podemos (CatECP), the left force that supports a Catalan right to decide but not independence, continues to occupy a narrow space in between — but with no influence on the balance of power. The result was also not very different from the averages of poll predictions since Spanish prime minister Mariano Rajoy announced elections on October 27 as part of his crackdown on the rebellious region that had organised an “illegal” referendum on independence. These polls gave the pro-independence bloc 66-67 seats (the majority is 68); the unionist bloc 59-60 seats and CatECP 9-10 seats. The final result was 70 for the pro-independence bloc of Together For Catalonia (JxCat), the Republican Left of Catalonia (ERC) and the People’s Unity List (CUP). This was down two seats compared to the 2015 poll. The unionist bloc of Citizens (Cs), the Party of Socialists of Catalonia (PSC) and the People’s Party (PP) won 57 (up five from 2015); and CatECP won eight (down three). However, these small differences between prediction and result give no sense of the huge struggle that produced the final outcome. The vast offensive by the Spanish political, economic and media powers-that-be on behalf of the unionist parties (especially Citizens) faltered against a stubborn counter-mobilisation by the three forces supporting Catalan independence. The upshot was that an election designed by the Rajoy government to legitimise its October 27 coup against Catalan self-rule, under article 155 of the Spanish constitution, turned into a boomerang. The pro-independence forces kept their majority and those opposing Madrid’s article 155 intervention — the pro-independence forces plus CatECP — won a 78-seat majority in the 135-seat Catalan chamber. The Spanish PP government even failed to achieve what would have been its minimum war aim: to have CatECP — sworn not to support a government including JxCat — hold the balance of power and thus block the continuation of pro-independence government in Catalonia. Rajoy’s failure was dramatised by the devastation of the Catalan branch of his own party: the PP collapsed from 11 seats to three, losing all representation outside of Barcelona and its status as a distinct group in the Catalan parliament. The emergence of the pro-unionist Citizens as the largest Catalan party (much boosted and spun in the Spanish media) could not mask the defeat. “The win of Citizens is no palliative for the defeat of the parties that dubbed themselves ‘constitutionalist’. These are the political formations that posed these special elections as a clash between independentism and constitutionalism. Despite an atmosphere of economic blackmail, with daily news of “another firm leaving Catalonia”. In short, the Spanish state’s powers-that-be threw everything short of outright ballot-rigging into winning December 21 for unionism and failed. The participation rate was the clearest sign of the fierceness of the struggle that produced what exiled Catalan president Carles Puigdemont called “the defeat of the 155 Monarchy by the Catalan Republic”. At 81.9%, participation was the highest ever in any election in Catalonia since the end of the Franco dictatorship more than 40 years ago: 6.99% higher than the previous record for a Catalan regional poll (reached in 2015) and 21.2% higher than the average of Catalan regional contests between 1984 and 2012. The participation rate increased most in Barcelona province (by 7.27%), largely reflecting the anti-Catalanist drive of Citizens to mobilise voters on the basis of identification with their origins elsewhere in the Spanish state. However, it also rose in all three other Catalan provinces (by 6.98% in Lleida, 6.22% in Tarragona and 5.57% in Girona) as the two blocs strained to mobilise every last vote. As a result, 177,000 more than in 2015 voted for unionist parties (with around 100,000 of these basically shifting from the now defunct Democratic Union of Catalonia to the PSC), while 96,000 more voted for pro-independence forces. The left that supports a Catalan right to decide, but not necessarily independence, lost 44,000 votes. Support for “others” increased by 3000. In percentage terms, support for unionism rose by 1.87%, support for pro-independence parties fell fractionally by 0.31% (even while rising in Lleida and Tarragona provinces), support for the right-to-decide left fell by 1.49% and support for “others” barely changed. At the level of Catalonia’s 42 shires or counties, only Garraf passed across to unionism, by a very slight margin. The biggest increase for unionism was in the industrial and working class Baix Llobregat (2.67%). Even here, however, support for pro-independence parties also increased (by 0.6%), with the losses falling to CatECP (down 3.24%). In the shires of pro-independence Girona province, the swing to unionism was often under 1%, accompanied by a very slight fall in support for independence and a smaller loss for CatECP. For example, in the staunchly pro-independence Pla d’Estany, the unionist vote increased by 0.79%, independentism fell by 0.9% and support for CatECP fell by 0.01%. Such was the meagre result of an unprecedented pouring of funds into the coffers of Citizens, which resulted in Barcelona’s outer working-class suburbs being plastered in a sea of orange propaganda (Citizens’ colour). This near gridlock between the opposing camps contrasted with the volatility of changes within them. The life-or-death fight between unionism and pro-independentism had this impact because voters on both sides had to work out which of the three options on offer in their camp would provide the best chance of beating the adversary. As a result, polls predicted trends within the blocs with much less accuracy. This was not the fault of the pollsters: with up to 1.2 million of Catalonia’s 5.5 million voters still undecided two days before the vote, it was impossible to pick the last-minute trends. In the end the polls — including those published outside the Spanish state to dodge the ban on polling in the last week of the campaign —missed or understated big voting shifts. (See below for a map of how voting patterns changed at this election compared to the 2015 poll). The most important was the victory within the independence camp of JxCat. Put together by exiled President Carles Puigdemont as a “party of Catalonia” affirming the legitimacy of his deposed government, JxCat featured non-party candidates from social, scientific, cultural and sporting life. Ministers from Puigdemont’s right-nationalist Catalan European Democratic Party (PdeCat) government were the only representatives of this party within this broader ticket. Its message was simple (“Puigdemont, Our President”). Its chief weapon against ERC, its main rival for the pro-independence vote, was the claim that proposing any other candidate for president than Puigdemont would legitimise Madrid’s article 155 takeover. In the end, this message, conveyed by direct television link to hundreds of meetings in Catalonia from Puigdemont’s Brussels exile, convinced tens of thousands of undecided supporters of Catalan sovereignty that the clearest and safest way of voting against Rajoy’s article 155 intervention was to show support for its main victim. As a result, JxCat won its struggle over ERC by 34 seats to 32, a result no poll predicted. Indeed, polling before the formation of JxCat had ERC winning 40 seats or more over a PDECat reduced to around 15. The formation of JxCat doubled the expected vote of the right-nationalist formation, allowing traditional ERC and even CUP voters to support it. The core of the JxCat win came in Puigdemont’s home province of Girona, which returned seven JxCat MPs to ERC’s four. JxCat also won Lleida province, five seats to the ERC’s four. For ERC, these losses were not offset by wins over JxCat in the more industrial, working-class and Spanis-speaking provinces of Barcelona (18 seats to 17) and Tarragona (five seats to four). In general, ERC prevailed over JxCat in the cities and larger towns and along the Mediterranean coast, while the position was reversed in inland rural regions. ERC made important advances in working-class towns Santa Coloma de Gramenet, l’Hospitalet, Badalona, Rubí, Cornellà as well as in Barcelona working class district Nou Barris. The switch to the vote for “the president” was also an important factor in the CUP’s loss of six seats, four in Barcelona province and one each in Tarragona and Lleida. For example, in the working-class Barcelona district of Sant Andreu, the vote for pro-independence parties in 2017 was exactly the same as in the 2015 “plebiscitary” election that gave Catalonia its first pro-independence government — 44.12%. In 2015, this vote was divided between Together For The Yes (JxSí), a coalition of the CDC, ERC and independents, which won 33.84% and the CUP, which won 10.28%. On December 21, the division was ERC 23.51%, JxCat 15.72% and the CUP 4.89%. These figures reflected both the broad leftward shift within Catalan nationalism since 2012 (when the vote in Sant Andreu was 23.46% for right nationalism, 14.41% for the ERC and 3.81% for the CUP), but also the importance that pro-independence voters placed on opposing article 155 and recovering Catalan self-rule. For Catalonia as a whole, while the CUP vote fell, the joint JxCat and ERC vote, representing support for the parties that had run the deposed Catalan government, rose from 39.6% to 43%. The CUP’s losses were greatest in Barcelona province, where it lost four of its seven seats as its vote fell from 8.28% to 4.36% (representing a loss of 113,000 voters). In Girona province, the one jurisdiction where it did not lose seats, the loss was less (from 8.58% to 5.31%). Further analysis will be needed as to the main reasons for the CUP’s setback. Was it that its insistence on unfolding the Catalan Republic on the basis of the October 1 referendum result lost it support among pro-independence supporters more worried about recovering Catalan self-government? Or were its losses inevitable in the siege atmosphere created by the article 155 intervention? On the unionist side, the losses all piled onto the back of the PP: its vote halved from 8.49% to 4.24%, while its representation crashed from 11 seats to three (all in Barcelona province). The PP paid this price not only because the Rajoy government had implemented 155, but because its tacticians decided that the best way of defending and extending its voting base in the face of the challenge from Citizens was to boast about its splendid record. Spanish deputy prime minister Soraya Saenz de Santamaria told a Girona meeting: “Who has left ERC and the PDECat leaderless after decapitating both parties? Mariano Rajoy and the PP. Who put an end to the law being flouted? Mariano Rajoy and the PP. Who closed the Catalan embassies? Do you know what [Catalan diplomatic service] Diplocat is called now? It’s called ‘Diplocat in liquidation’. Citizens, by contrast, placed no special emphasis on its support for 155. Its main vote-harvesting tactic was a Goebbelsian propaganda war against the Catalan independence movement as a threat to social harmony and the rights and culture of immigrants from the rest of the Spanish state — those who more often than not have had to do the worst jobs to give their families a future. Citizens successfully channelled the anger of a lot of Barcelona’s mainly Castilian-speaking working class “industrial belts” into resentment of all things Catalan. This was expressed in Citizens’ leader Inés Arrimades’s mantra that, “When Citizens governs there’ll be no need to change the TV channel [from Catalan public television’s TV3]” and “We’ll return Castilian to the schools and the institutions”. Thirty years of corrupt right-nationalist rule in Catalonia — only partially alleviated by the 2003-2010 “tripartite” government of PSC, ERC and Initiative for Catalonia-Greens (ICV, now part of CatECP) —fertilised the ground for the growth of Citizens. It first stepped beyond the status of minor party at the 2015 “plebiscitary” elections, when it won 25 seats as Catalan independence’s most resolute opponent. At this election, the decision of ERC not to support the continuation of the 2015 JxSí alliance with CDC (now PDECat) created the potential that Citizens could emerge as the most-voted party: from the announcement of the election, most polls showed the Spanish-centralist formation winning a relative vote majority and roughly half of them showed it winning more seats than ERC. The final result revealed that Citizens did better on both votes and seats than most polls predicted: 25.4% of the vote and 37 seats, an increase of 12 on 2015. Seven of these came in Barcelona province, two each in Girona and Tarragona and one in Lleida. This election saw the working-class “red belts” around Barcelona, where the PSC has traditionally been the hegemonic party, turn orange as the vote for Citizens jumped by up to 14% (the party’s Catalonia-wide increase was 7.47%). The orange tide also overwhelmed municipalities run by parties and coalitions to the left of the PSC. This was the case in PSC municipal strongholds like Santa Coloma de Gramenet, Cornellà de Llobregat, as well as in Sant Vicenç dels Horts, where jailed ERC leader Oriol Junqueras was once mayor, Badalona, Catalonia’s third largest city and run by a left coalition and Sabadell (where the mayor is from the CUP). The advance of Citizens in these regions represented a defeat for the left in the broadest sense (the PSC plus CatECP), for more than 30 years hegemonic in industrial and working-class Barcelona and Tarragona. The defeat was less severe for the PSC, which managed to increase its vote (by 1.16%) and representation (by one seat, to 17), probably due to it absorbing the vote of the extinct Christian democrat UDC. However, in the atmosphere of heated confrontation between unionism and independentism, the PSC was no competition for Citizens. Its message of the need to get Catalonia back to reconciliation and normality after the “madness” of the Puigdemont years could not compete with the revanchist “Spain-Spain-Spain” frenzy of Citizens and its media and financial backers. When PSC leader Miquel Iceta said during the campaign that he was opposed to any changes to Catalonia’s education system and that the jailed pro-independence leaders should be pardoned, it was confirmation to the anti-Catalanist bulk of unionism that he was not their man. CatECP suffered even more than the PSC from its message of “neither 155 nor UDI [Unilateral Declaration of Independence]”. It lost 44,000 votes (1.49%) compared to its predecessor Catalonia Indeed We Can (CSQEP), falling from 11 seats to eight and losing its presence in Lleida province. 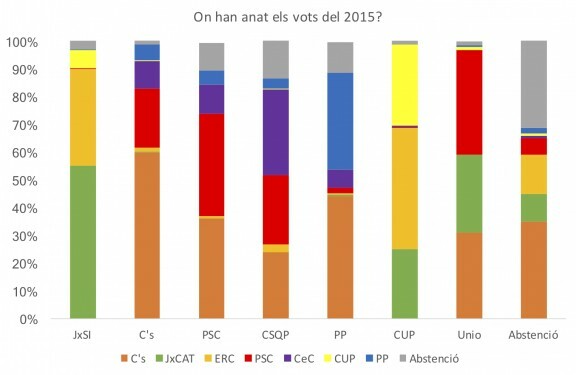 CatESP should have been more attractive to voters than CSQEP because of the inclusion in the coalition of Barcelona Together and Barcelona mayoress Ada Colau. However, its refusal to accept October 1 as a real referendum combined with its position that the only real referendum would be one negotiated with the Spanish government (when?) alienated people who had risked life and limb to make October 1 happen in the face of Spanish police violence. CatECP’s lack of definition on the central issue of the election — the legitimacy or not of the deposed Puigdemont government — could not be offset by its talk about the need to “bring the social back into the centre of politics”. Nor could the backing the ticket received from international left personalities like Naomi Klein, Jean-Luc Mélenchon and Yanis Varoufakis compensate for a message that at times sounded as if the Catalan government’s declaration of independence was as evil as the Rajoy’s government’s removal of Catalan self-rule. The core of the CatECP campaign was to point to the achievements of Barcelona Council under Ada Colau and ask voters to think what could be achieved if these were extended to all Catalonia. However, the predominance of the struggle in support of and against Rajoy’s 155 coup meant that this message carried a lot less weight than it might have in other circumstances. The December 21 Catalan election result was a victory for democratic rights and a defeat for the oppressive authoritarianism of the Spanish government. Once again, as on November 9, 2014 and October 1 (when Rajoy insisted, falsely, “there will be no referendum”) its schemes have been thwarted. Confirmation of that is the debate already open in ruling circles as to whether the Spanish prime minister has passed his use-by date and how to block the formation of a new pro-independence Catalan government. Such hawkish calls for the Rajoy government to refuse any concession to the Catalan majority that has clearly rejected its article 155 intervention and the continuing use of the law as a political weapon demands a counterattack for Catalonia’s democratic rights. Deposed Catalan President Puigdemont has already fired the first shots in that offensive, calling on Spanish King Felipe to use his Christmas message to speak out for reconciliation and negotiation between Spain and Catalonia. The growing international solidarity movement with Catalonia must now make its voice heard, calling for the return of Catalan self-rule, the immediate release of the political prisoners and an end to all prosecutions related to the preparation of the October 1 referendum. In that way it will be doing its bit to turn the Spanish state’s stalled offensive against Catalonia’s right to self-determination into the start of an advance for democratic rights in the whole Spanish state.